A new article published in Health Research Policy and Systems sets out how the 2018 Access to Medicine Index will analyse pharmaceutical companies R&D pipelines to meet priority global health targets. 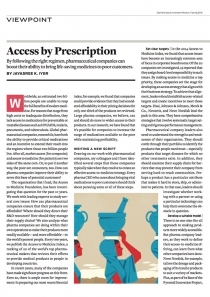 In the article “Developing the latest framework to measure and incentivise pharmaceutical industry contributions to health R&D“ researchers from the Access to Medicine Foundation describe how changes to the Index methodology will allow the 2018 Access to Medicine Index to identify which of the world’s largest pharmaceutical companies most closely align their R&D activities with global health priorities. The range of diseases covered by the Index has been expanded to cover all priority R&D target lists drawn up by leading global health organisations, including the World Health Organization and Policy Cures Research. “By pulling together these different priority lists, the Index gives a comprehensive to-do list for the R&D-based pharmaceutical industry to develop the medicines our global community needs most,” explains Danny Edwards, Research Programme Manager for the Access to Medicine Index. The Foundation’s research team is now looking to see which R&D priorities are being targeted by the 20 pharmaceutical companies in scope, by cross-referencing them with companies’ R&D pipelines. The findings will be reported in the 2018 Access to Medicine Index, planned for publication in November. A researcher examines tissue for signs of cancer. There is currently no published priority R&D list for non-communicable diseases, including cancer. Photo: Roche. The 2018 Index covers 77 diseases, including 45 that have been named as priority targets for pharmaceutical R&D. The priority targets include communicable diseases such as tuberculosis and malaria, neglected tropical diseases and maternal and neonatal health conditions. However, as the article explains, there is no published priority R&D list for non-communicable diseases (also known as NCDs or ‘lifestyle diseases’) such as diabetes and cancer. WHO pathogen priority list for R&D of new antibiotics (2017). The 2018 Access to Medicine Index is planned for publication in November 2018.